← What health insurance plans sold inside AND outside the exchanges must cover and who will pay for it all. The Impact of the PPACA ‘Roberts Tax’ on Individuals, Taxpayers and Business Owners. The best way to describe this new tax is to imagine walking into a grocery store and the clerk asks if you would like to purchase a pack of gum. You politely decline the offer and are then forced by a new tax law – as defined by John Roberts – to give that clerk a tax for refusing to purchase that pack of gum. This, my fellow Americans, is how unmoored from our Constitution that our Federal Government has become. It is important to note that this new ‘Roberts Tax’ is a tax that was vehemently denied by President Obama on multiple occasions as being a tax at all. In the interview below with ABC news, President Obama passionately refutes the very definition of a tax, as defined in the dictionary, in order to continue to message this new tax as a ‘fine’ and not a tax. The reason President Obama so passionately refuted the fact that this new ‘Roberts Tax’ is indeed a tax and instead messaged it as a ‘fine’ is because he made a ‘firm pledge’ (in the video below) to the American people in Dover, New Hampshire, prior to the passage of the PPACA. “I can make a firm pledge. Under my plan, no family, making less than $250,000 a year will see any form of tax increase. Not your income tax, not your payroll tax, not your capital gains taxes, not any of your taxes.” – Barack Obama. 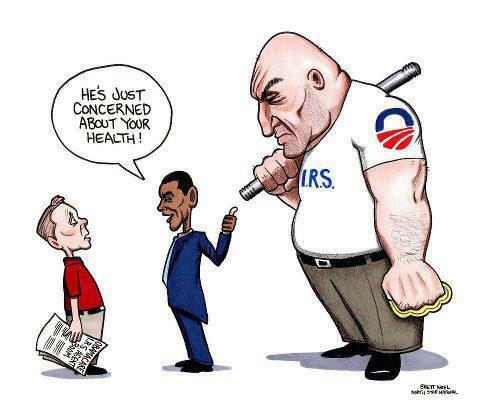 Beginning January 1, 2014, this new ‘Roberts Tax’ will affect nearly all Americans. None more onerously than small business owners with 50 or more full-time employees who do not offer health insurance to their employees. Or, do not offer a health insurance plan that includes the new PPACA mandated “Essential Health Benefits Package“. These small business owners are referred to by the Obama administration as ‘Large Employers’. The Obama administration considers a ‘Large Employer’ as one with more than 50 full-time employees in calendar year 2013. Thanks to a ‘new rule’ written by HHS, a full-time employee has now been REDEFINED as one who works 30 hours or more each week (traditionally ‘full time’ employee has been one who works 40 hours per week). Full-time seasonal employees who work for less than 120 days during the calendar year are excluded from any PPACA ‘Robert’s Tax’ calculations. However, the hours worked by part-time employees are included in the calculation of a ‘Large Employer’, each month, by dividing their total number of monthly hours worked by 120. 20 employees multiplied by 96 hours = 1920 total hours worked. 1920 hours divided by 120 = 16 full time employees. Isn’t this fun? Oh wait, there’s more! Beginning in 2014, many employees who are not offered health insurance through their employer and who are not eligible for Medicaid may be eligible for “Advanced Premium Tax Credits” for coverage through a PPACA “Health Insurance Exchange”. The PPACA empowers the Internal Revenue Service to allot ‘Advance Premium Tax Credits’ to childless adult individuals with incomes surpassing 138% of the Federal Poverty Level and families 400% of the Federal Poverty Level. Using 2012 FPL, this would mean that individuals in 48 contiguous states & D.C. making $42,680 annually and families making $92,200 would now qualify for an ‘Advance Premium Tax Credit’ in state-based PPACA “Health Insurance Exchanges”. The IRS has released additional ‘guidance’ related to the PPACA “Employer Shared Responsibility” rules. The guidance includes proposed regulations published in the Federal Register on Wed. January 2nd, 2013 and a series of questions and answers published on the IRS website. For the most part the new guidance closely follows previous guidance released by the IRS. However, there are a number of clarifications and some important new information for employers to consider. 4980H(a) liability – Applies if an employer fails to offer to its full-time employees (and their dependents) the opportunity to enroll in minimum essential coverage (MEC), and any full-time employee is certified as having received a subsidy (i.e. 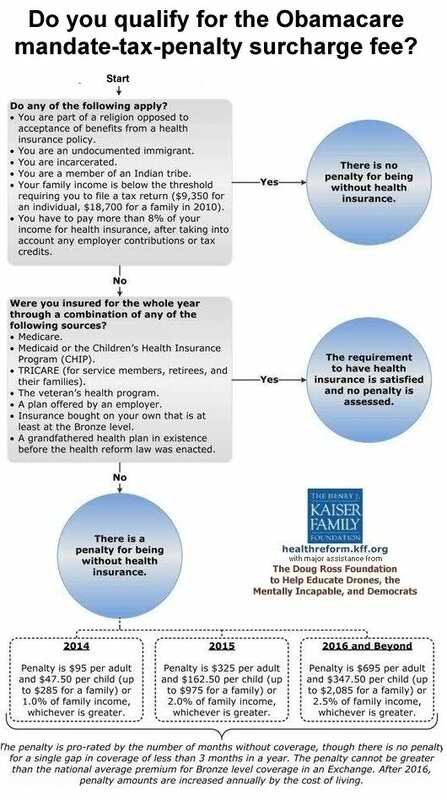 a premium tax credit or cost sharing reduction) when purchasing individual health insurance through a public Exchange. In this case the employer may be liable for a penalty of $2000 per year times the total number of full-time employees (not counting the first 30). An applicable large employer is an employer that employed an average of at least 50 full-time employees during the preceding calendar year. See below for additional details on how related organizations and corporations under common control will be treated for the purpose of this rule. The IRS guidance provides transition ‘relief’ for non-calendar year plans. Employers who sponsor non-calendar year plans will not be liable for any 4980(H) liability until the first plan year beginning after January 1, 2014. To be eligible for this transition ‘relief’, an employer must have maintained the non-calendar year plan as of December 27, 2012 (the day prior to the initial release of the rule). This provision eliminates the opportunity for an employer to change plan years in an attempt to delay being subject to 4980(H) liability. As stated above, an employer faces potential penalties under 4980H(a) if it fails to offer minimum essential coverage to all full-time employees. The IRS has previously commented that the penalty should not apply in the case of an employer that intends to offer coverage to all its full-time employees, but fails to offer coverage to a few full-time employees. IRS Notice 2011–36 initially addressed this issue by indicating that the IRS was contemplating a rule stating that an employer offering coverage to “substantially all” of its full-time employees would not be subject to a 4980H(a) assessable payment. In the new guidance the IRS allows a margin of error regarding this requirement, and has introduced a “95%” standard. An applicable large employer will be treated as offering coverage to its full-time employees if it offers coverage to all but 5% (or if greater, five) of its full-time employees. This rule alleviates employer fears that a small administrative mistake could trigger significant employer penalties. All entities and organizations treated as a single employer under the rules contained in Code §414 are combined in determining if an employer is an “applicable large employer.” Consequently, a number of smaller organizations (that may not each have 50 FTEs) could be subject to 4980(H) liability if they are considered under common control according to §414 rules. Penalties will apply separately to each member organization of a control group. For example, if one member organization fails to provide MEC to all its full-time employees, the penalty would be based on the number of full-time employees in that particular organization, not the total number of employees in the entire control group. In calculating the 4980H(a) liability, the “not counting the first 30 rule” would apply proportionality to each member entity. For example, a member entity that accounts for 50% of the total full-time employees in the control group would pay a penalty of $2000 per year times the number of full-time employees in that specific entity not counting the first 15 (50% of 30). To avoid 4980(H) liability, employers must offer coverage to all full-time employees and their dependents. It is important to note that the cost of the dependent coverage is not used in determining the plan’s affordability under 4980(H). Plan affordability for employer penalty purposes is based only on the amount the employee must pay for self-only coverage. In what was a surprise to many observers, the requirement to offer coverage to dependents does not apply to spouses. The proposed regulations define an employee’s dependents for purposes of 4980(H) as an employee’s child who is under 26 years of age. Employers face potential liability under 4980(H)(b) if the employer coverage is not affordable to an employee. Coverage is affordable if the employee’s required contribution for self-only coverage does not exceed 9.5% of the employee’s household income. Recognizing that employers will generally not know an employee’s household income, the IRS outlined a proposed affordability safe harbor (referred to as the W–2 safe harbor) in prior notices. The proposed regulations provide two additional safe harbors for determining affordability. W-2 Safe Harbor – An employer will not be subject to an assessable payment if the required employee contribution toward the self-only premium for the employer’s lowest cost coverage that provides minimum value, does not exceed 9.5 % of the employee’s W–2 wages. Rate of Pay Safe Harbor – An employer can take the hourly rate of pay for each hourly employee and multiply that rate by 130 hours per month to determine a monthly “rate of pay.” The employee’s monthly contribution amount (for the self-only premium of the employer’s lowest cost coverage that provides minimum value) is affordable if it is equal to or lower than 9.5% of the computed monthly wage estimate. For salaried employees, monthly salary would be used instead of hourly salary multiplied by 130. Employees enrolled in a non-calendar year Section 125 Cafeteria plan who are eligible on January 1, 2014 for subsidized coverage when purchasing health insurance through a public Exchange may wish to drop the employer plan during the plan year. However, current Section 125 rules would not permit a mid-plan-year election change in this situation. The proposed regulations allow an employer to amend their Section 125 plan to permit this change. Interestingly, the rules do not require the employer to allow this election change. Some employers may be inclined not to permit such a change if an employee moving to subsidized individual coverage triggers employer liability under the shared responsibility rules. In August 2012 the IRS released significant guidance on defining an employee’s full-time status, including an optional look back measurement period and corresponding stability/eligibility period. The new proposed regulations clarify and expand on a number of issues related to these full-time employee rules. The guidance clarifies that that an employer can use the standard look back measurement period each year to determine the full-time status of all ongoing employees. However, for new employees, an initial measurement period can be applied only to “variable hour” and seasonal employees. A plan may not have a waiting period of more than 90 days for all other employees expected to work 30 hours or more per week. When determining eligibility for 2014, an employer who plans to use a 12-month measurement and stability period is allowed to use a shorter measurement period in 2013, which will apply to the 2014 stability period. However the 2013 one-time “short” measurement period must be at least 6 months long and begin no later than July 1, 2013. An employee hired to work an average of at least 30 hours per week cannot be treated as a variable hour employee simply because they are hired into a high turnover position. These employees must be treated as full-time employees and can have no more than a 90-day waiting period before being eligible for coverage. These new ‘Interim Final Rules’ contain other miscellaneous guidance, including rules of special interest to staffing firms. One such set of “anti-abuse” rules is designed to limit an employer’s ability to use temporary staffing arrangements to avoid 4980(H) liability. Finally, ‘Extra Large Employers’ that offer health insurance to more than 200 full-time employees must automatically enroll new full-time employees in a plan (and continue covering current employees). Many of these ‘Extra Large Employers’ offer ‘self funded plans’ with ‘stop loss arrangements’ and defined ‘attachment points’. For now, these employers are in luck for they are EXEMPT from many of the more onerous regulations imposed by the PPACA. For an excellent break down of the regulations these employers are required to comply with visit this link. It is this expert’s opinion that among the reported 13,000 pages of additional regulations that have been written since the passage of the PPACA. There will most likely be regulations that change the exemptions that employers who offer ‘self funded’ plans currently enjoy. As insurance companies begin to offer newly designed ‘stop loss’ arrangements with smaller ‘attachment points’ to attract smaller employers. In fact, there is already a ‘PPACA panel’ exploring this as I write this article. Click here to watch a special report the PPACA’s impact on business. Let’s say you’ve read the above information and your brilliant mind starts devising an easy way out. For example, you decide it would be prudent to split up your company of 50 employees into 2 separate companies with 25 employees each. Great idea! The only problem is the Statist attorneys who helped craft the PPACA already thought of that. The IRS will still consider both of your companies as one company. That’s because the ‘Robert’s Tax’ relies on “controlled group” provisions. These provisions focus on who controls the company. If you are the named owner of those 2 companies, the IRS will combine all employees under both corporations and hit you with the ‘Robert’s Tax’. Let’s say your a business owner who employs 50 or more employees at completely different companies. You have 25 employees at a car repair shop and 25 at a restaurant. You would have to provide insurance or pay the “Roberts Tax” at both, even though each or your separate company has less than 50 employees. Again, it’s the named owner of those combined companies that the IRS looks at under ‘controlled group’ provisions. Worse yet, Married couples may also find themselves impacted by ‘controlled group’ provisions, since IRS law generally assumes an individual owns interest in their spouse’s business. Oh, it’ just keeps getting better doesn’t it? Get ready for more paperwork and new regulation compliance. And that they may lose the employer’s contribution to health coverage if they purchase health insurance through a PPACA ‘Health Insurance Exchange’. Besides the 20 new or higher taxes imposed by the PPACA which are listed at the end of this article. The non-partisan Government Accountability Office (GAO) compiled a list of 47 new regulations the IRS is empowered to administer in overseeing the PPACA. 1.) Prohibits group health plans from discriminating in favor of highly compensated individuals. 2.) Establishes a temporary reinsurance program to provide reimbursement for a portion of the cost of providing health insurance coverage to early retirees. 3.) Imposes a penalty on health plans identified in an annual Department of Health and Human Services (HHS) penalty fee report, which is to be collected by the Financial Management Service after notice by the Department of the Treasury (Treasury). 4.) Requires state exchanges to send to Treasury a list of the individuals exempt from having minimum essential coverage, those eligible for the premium assistance tax credit, and those who notified the exchange of change in employer or who ceased coverage of a qualified health plan. 5.) Provides tax exemption for nonprofit health insurance companies receiving federal start-up grants or loans to provide insurance to individuals and small groups. 6.) Provides tax exemption for entities providing reinsurance for individual policies during first 3 years of state exchanges. 7.) Provides premium assistance refundable tax credits for applicable taxpayers who purchase insurance through a state exchange, paid directly to the insurance plans monthly or to individuals who pay out-of-pocket at the end of the taxable year. 8.) Provides a cost-sharing subsidy for applicable taxpayers to reduce annual out-of-pocket deductibles. 9.) Outlines the procedures for determining eligibility for exchange participation, premium tax credits and reduced cost-sharing, and individual responsibility exemptions. 10.) Allows advance determinations and payment of premium tax credits and cost-sharing reductions. 11.) Authorizes IRS to disclose certain taxpayer information to HHS for purposes of determining eligibility for premium tax credit, cost-sharing subsidy, or state programs including Medicaid, including (a) taxpayer identity; (b) the filing status of such taxpayer; (c) the modified adjusted gross income of taxpayer, spouse, or dependents; and (d) tax year of information. 12.) Provides nonrefundable tax credits for qualified small employers (no more than 25 full-time equivalents (FTE) with annual wages averaging no more than $50,000) for contributions made on behalf of its employees for premiums for qualified health plans. 13.) Requires all U.S. citizens and legal residents and their dependents to maintain minimum essential insurance coverage unless exempted starting in 2014 and imposes a fine on those failing to maintain such coverage. 14.) Requires every person who provides minimum essential coverage to file an information return with the insured individuals and with IRS. 15.) Imposes a penalty on large employers (50+ FTEs) who (1) do not offer coverage for all of their full-time employees, offer unaffordable minimum essential coverage, or offer plans with high out-of-pocket costs and (2) have at least one full-time employee certified as having purchased health insurance through a state exchange and was eligible for a tax credit or subsidy. 16.) Requires information reporting of health insurance coverage information by large employers (subject to IRC 4980H) and certain other employers. 17.) Offers tax exclusion for reimbursement of premiums for small-group exchange participating health plans offered by small employers to all full-time employees as part of a cafeteria plan. 20.) Requires the independent institute partnering with the National Academy of Sciences (NAS) to implement a key national indicator system to be a nonprofit entity under section 501(c)(3). 21.) Imposes a fee through 2019 on specified health insurance policies and applicable self-insured health plans to fund the Patient-Centered Outcomes Research Trust Fund to be used for comparative effectiveness research. 22.) Imposes a 40 percent excise tax on high cost employer-sponsored health insurance coverage on the aggregate value of certain benefits that exceeds the threshold amount. 23.) Requires employers to disclose the value of the employee’s health insurance coverage sponsored by the employer on the annual Form W-2. 24.) Repeals the tax exclusion for over-the-counter medicines under a Health Flexible Spending Arrangement (FSA), Health Reimbursement Arrangement (HRA), Health Savings Account (HSA), or Archer Medical Savings Account (MSA), unless the medicine is prescribed by a physician. 25.) Increases tax on distributions from HSAs and Archer MSAs not used for medical expenses. 26.) Limits health FSAs under cafeteria plans to a maximum of $2,500 adjusted for inflation. 27.) Imposes additional reporting requirements for charitable hospitals to qualify as tax-exempt under IRC 501(c)(3) and requires hospitals to conduct a community health needs assessment at least once every 3 years and to adopt a financial assistance policy and policy relating to emergency medical care. 28.) Imposes a fee on each covered entity engaged in the business of manufacturing or importing branded prescription drugs. 29.) Imposes an annual fee on any entity that provides health insurance for any U.S. health risk with net premiums written during the calendar year that exceed $25 million. 30.) Allows the deduction for retiree prescription drug expenses only after the deduction amount is reduced by the amount of the excludable subsidy payments received. 31.) Increases the threshold for the itemized deduction for unreimbursed medical expenses from 7.5 percent of Adjusted Gross Income (AGI) to 10 percent of AGA (unless taxpayer turns 65 during 2013-2016 and then threshold remains at 7.5 percent). 32.) Denies the business expenses deductions for wage payments made to individuals for services performed for certain health insurance providers if the payment exceeds $500,000. 33.) Imposes an additional Hospital Insurance (Medicare) Tax of 0.9 percent on wages over $200,000 for individuals and over $250,000 for couples filing jointly. 34.) 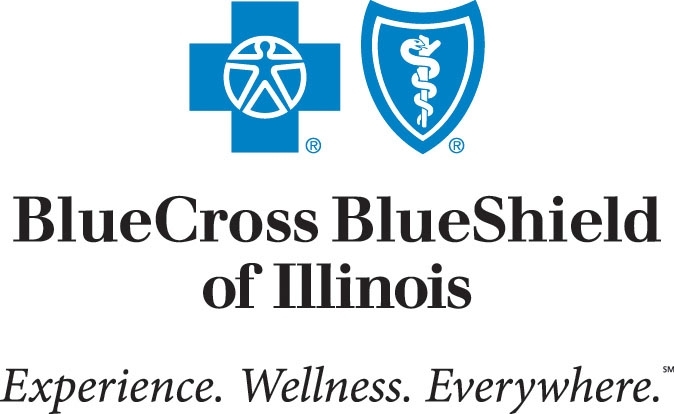 Limits eligibility for deductions under section 833 (treatment of Blue Cross and Blue Shield) unless the organizations meet a medical loss ratio standard of at least 85 percent for the taxable year. 35.) Allows an exclusion from gross income for the value of specified Indian tribe health care benefits. 36.) Allows small businesses to offer simple cafeteria plans—plans that increase employees’ health benefit options without the nondiscrimination requirements of regular cafeteria plans. 37.) Establishes a 50 percent nonrefundable investment tax credit for qualified therapeutic discovery projects. 38.) Requires employers to provide free choice vouchers to certain employees who contribute over 8 percent but less than 9.8 percent of their household income to the employer’s insurance plan to be used by employees to purchase health insurance though the exchange. 39.) Imposes a tax on any indoor tanning service equal to 10 percent of amount paid for service. 40.) Excludes from gross income amounts received by a taxpayer under any state loan repayment or loan forgiveness program that is intended to provide for the increased availability of health care services in underserved or health professional shortage areas. 41.) Increases the maximum adoption tax credit and the maximum exclusion for employer-provided adoption assistance for 2010 and 2011 to $13,170 per eligible child. 42.) Extends the exclusion from gross income for reimbursements for medical expenses under an employer-provided accident or health plan to employees’ children under 27 years. 43.) Imposes an unearned income Medicare contribution tax of 3.8 percent on individuals, estates, and trusts on the lesser of net investment income or the excess of modified adjusted gross income (AGI + foreign earned income) over a threshold of $200,000 (individual) or $250,000 (joint). 45.) Amends the cellulosic biofuel producer credit (nonrefundable tax credit of about $1.01 for each gallon of qualified fuel production of the producer) to exclude fuels with significant water, sediment, or ash content (such as black liquor). 46.) Clarifies and enhances the applications of the economic substance doctrine and imposes penalties for underpayments attributable to transactions lacking economic substance. 47.) Increases the required payment of corporate estimated tax due in the third quarter of 2014 by 15.75 percent for corporations with more than $1 billion in assets, and reduces the next payment due by the same amount. What about that Small Employer Health Insurance Tax Credit? The tax credit is available from 2010 through 2015. 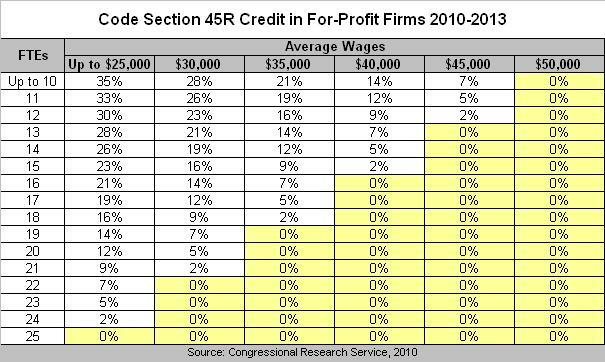 For 2010 – 2013 the maximum credit is 35% of qualified premium costs paid by for-profit companies, and 25% for non-profits. The maximum credit is only available to employers with no more than 10 full-time equivalent employees (FTE’s), who are paid average annual wages of $25,000 or less. A reduced credit is available on a phase-out basis for employers with between 10 and 25 FTE’s, who are paid average wages of $25,000 to $50,000. In effect, the credit is reduced by 6.667% for each FTE in excess of 10, and by 4% for each $1,000 in average annual wages paid above $25,000. For example, an employer with 13 full-time equivalent employees who are paid average annual wages of $45,000 will not receive a tax credit. 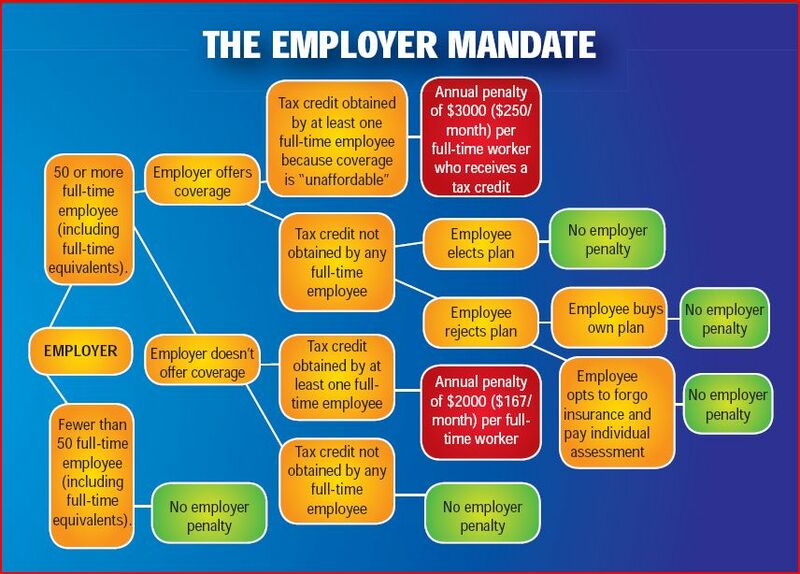 No tax credit is available for employers with 25 or more FTE’s, or who pay average annual wages of $50,000 or more. Have you noticed a common theme regarding the above new PPACA ‘Roberts Tax’ rules and regulations? That’s right, the fine for both the individual and for the employers is a fraction of the cost to purchase and maintain health insurance. This is not only why many employers will have a strong impetus to push their employees off of their health insurance plans but it is also why individuals will gladly pay the ‘Roberts Tax’ of $95 in 2014 (which graduates to $695 by 2016) instead of paying for a far more expensive health insurance plan. Worse yet, since the criminal fines (imprisonment) were removed from the PPACA legislation prior to passage. The only recourse that the Federal Government has to collect the ‘Roberts Tax’ is to hold one’s tax refund. Since nearly half of our nation pays no income taxes, how exactly will the IRS hold a tax refund from someone who pays no income taxes?! So, once again, who’s really going to be paying for all of this? That’s right! The few, the proud, the 53% of us who already pay all of the income taxes. Now that we’ve discussed the impact of the “Roberts Tax” on Individuals, Taxpayers and Business Owners. Let’s take a closer look at all of the 20 new or higher taxes levied upon taxpayers via the PPACA. Arranged by their respective effective dates, below is the total list of all $569 billion in tax hikes (over the next ten years) in the PPACA, where to find them in the bill, and how much your taxes were scheduled to go up based on initial projections by the CBO – Congressional Budget Office in the year 2010. 2012 updated CBO & JCT projections reflect a doubling of initial PPACA tax projections. As is the case with nearly all Government data houses, initial projections are rarely on target. Now, less than 2 years after initial 2010 projections. The Congressional Budget Office (CBO) and the Joint Committee on Taxation (JCT) confirm what America already knew – that the Democrats’ health care law is actually a $1.058 trillion tax hike that families and employers simply cannot afford. The recent Supreme Court ruling left in place 21 tax increases enacted as part of that law, a dozen of which – marked with an asterisk (*) below – target Americans earning less than $200,000 per year for singles and $250,000 per year for married couples, in clear violation of the President’s pledge to avoid tax hikes on low- and middle-income taxpayers. According to the new CBO and JCT estimates, the gross tax increases in the law now total $1.058 trillion over 2013-2022. That new amount is nearly twice the “advertised” ten-year tax hike amount claimed when Democrats originally pushed the law through Congress. 1 Includes CBO’s $216.0 billion estimate for “Associated Effects of Coverage Provisions on Tax Revenues” and $6.0 billion within CBO’s “Other Revenue Provisions” category that is not otherwise accounted for in the CBO or JCT estimates.